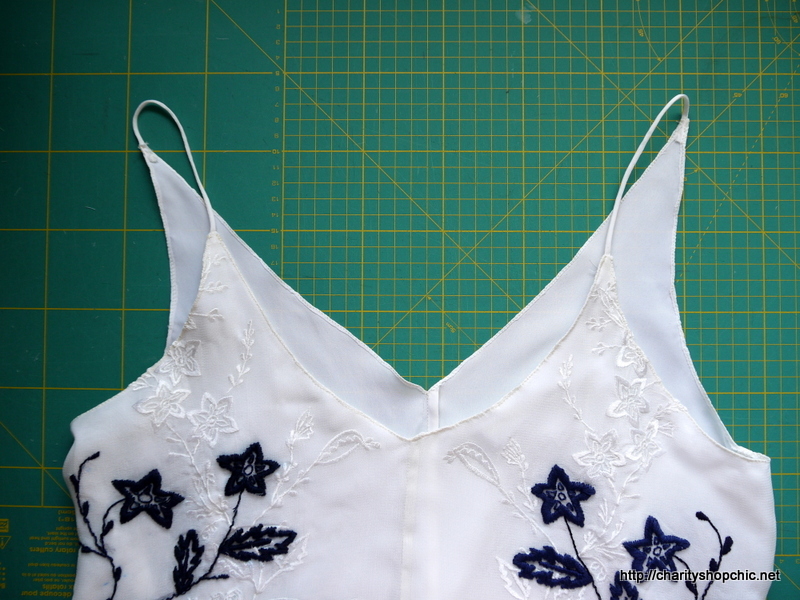 The idea for this one was to embroider over the embroidery in a contrasting colour, and then turn the pieces into a summer top. 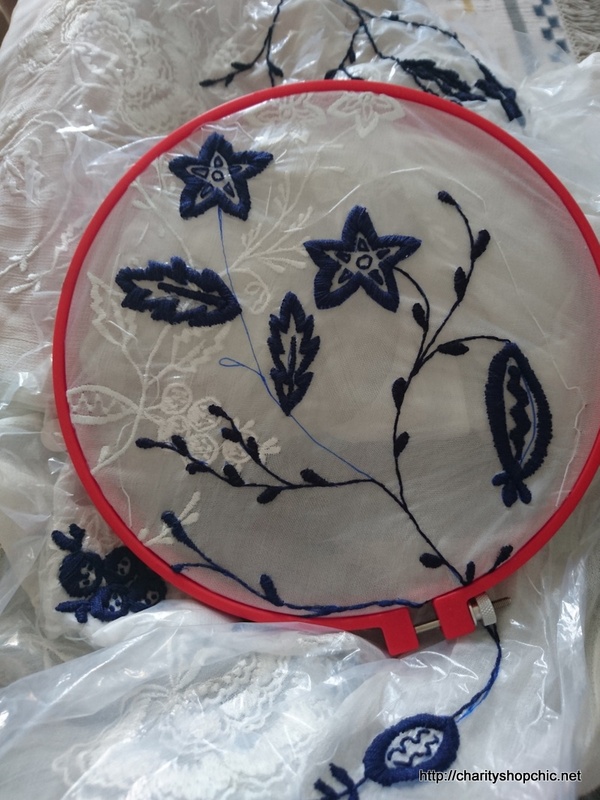 Since the material was fragile, I hooped it with a layer of embroidery stabiliser. The type I am using is the clear plastic type that dissolves in water. 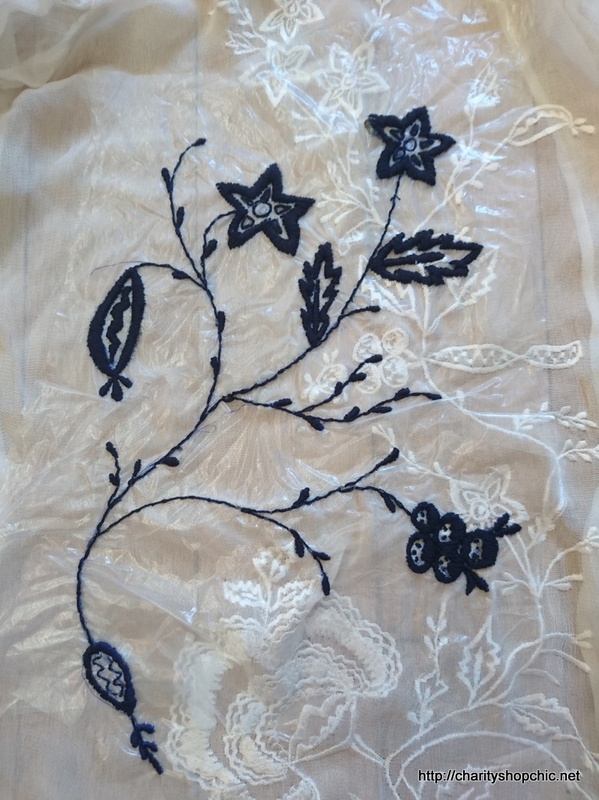 For the design, I took some of the leaf, fruit and flower shapes from the original embroidery. 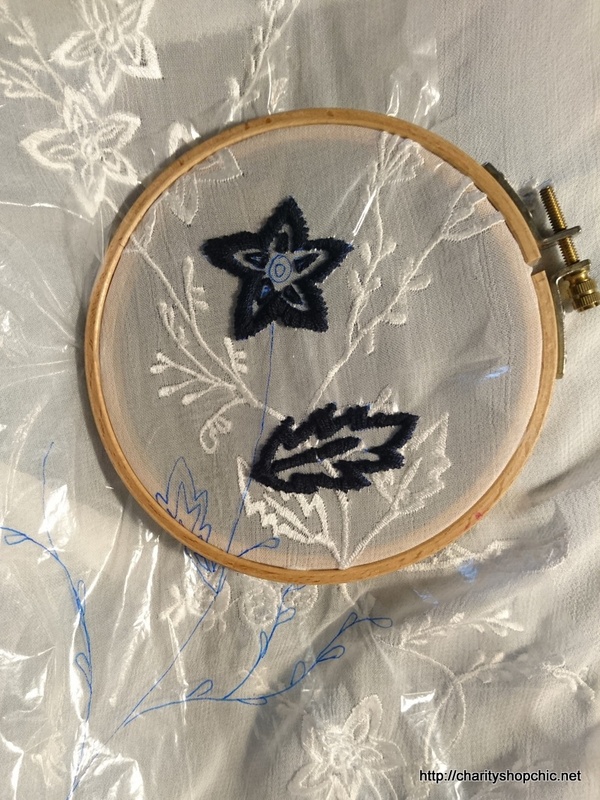 I drew a design onto the stabiliser as a guide, using as many of the original design elements as possible, then started stitching in navy blue. 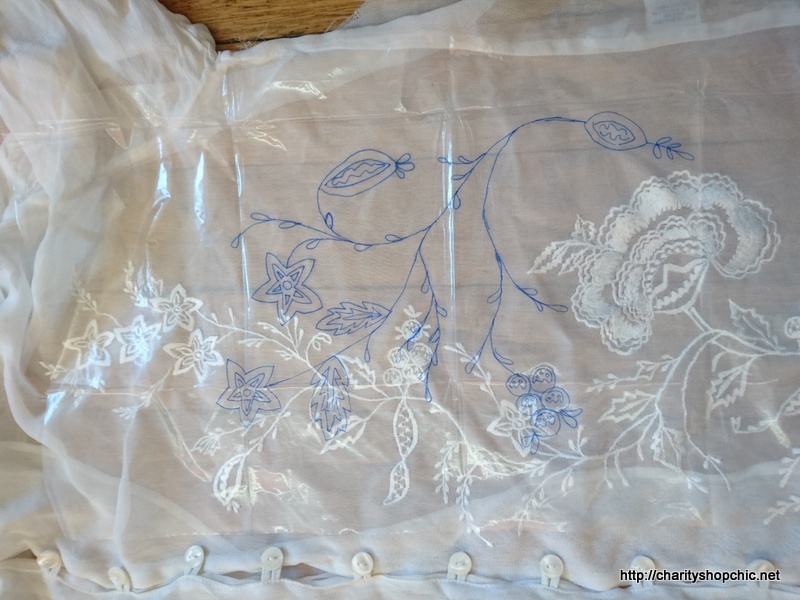 For the other half of the front, I traced the same design onto another piece of stabiliser, and flipped it over to make a mirror image on the other side. There was nothing particularly difficult about the stitching. All it needs really is patience. 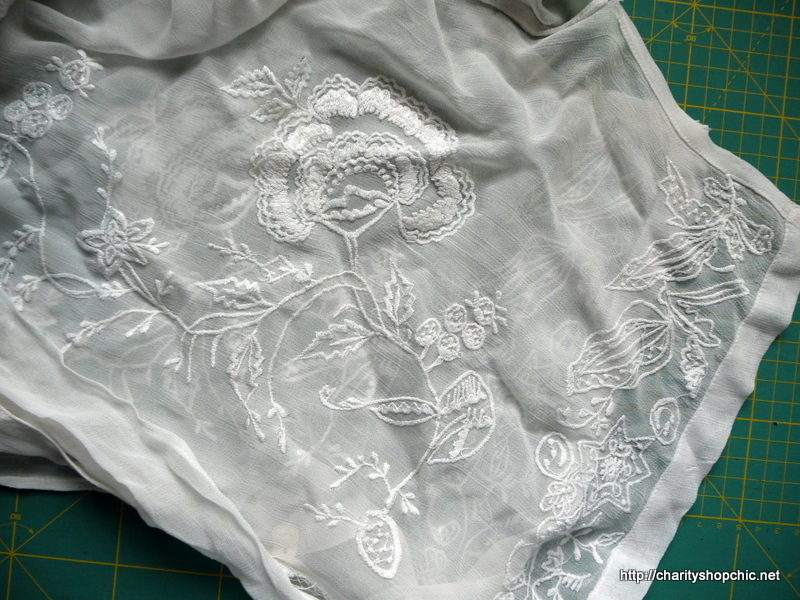 Here’s how the whole thing looked when I finished the embroidery (before I hand washed it to remove the stabiliser). I love this double embellished effect! 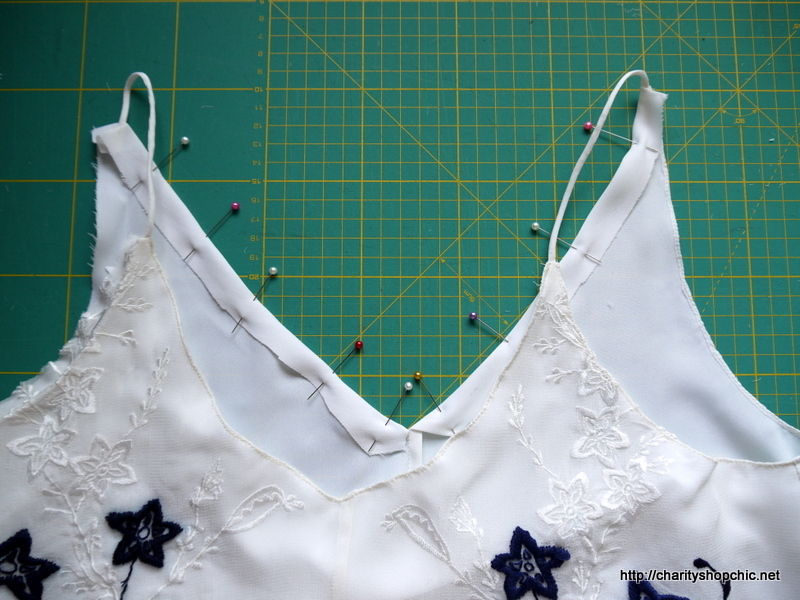 To turn it into a summer top, I made the front of the new top from the front panels of the old blouse, carefully cutting out the embroidered panels and French seaming at the centre front. 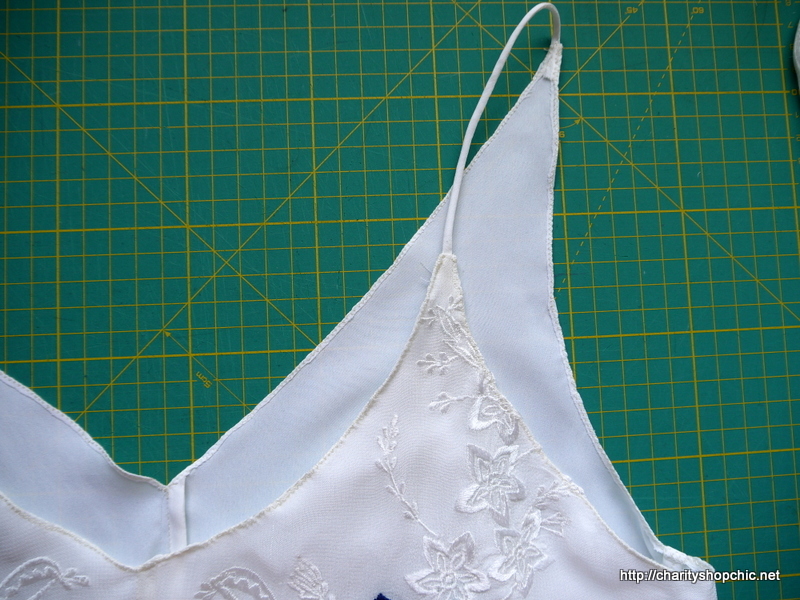 The new top is made from a vest pattern I traced from a top I already own. 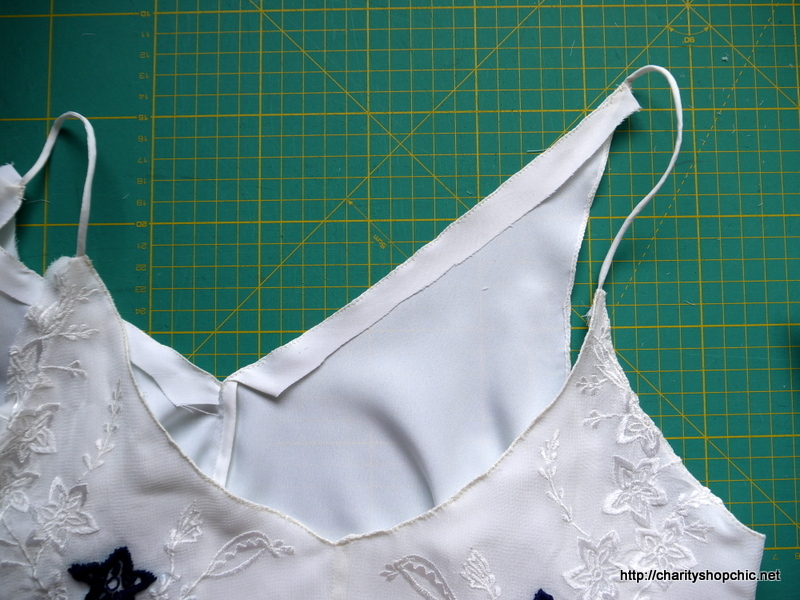 The panels turned out to be a little small for the embroidery to be placed where I wanted it – so some piecing had to be done, but I don’t think it’s noticeable. The rest of the top is made from an off white polyester I found in my stash. 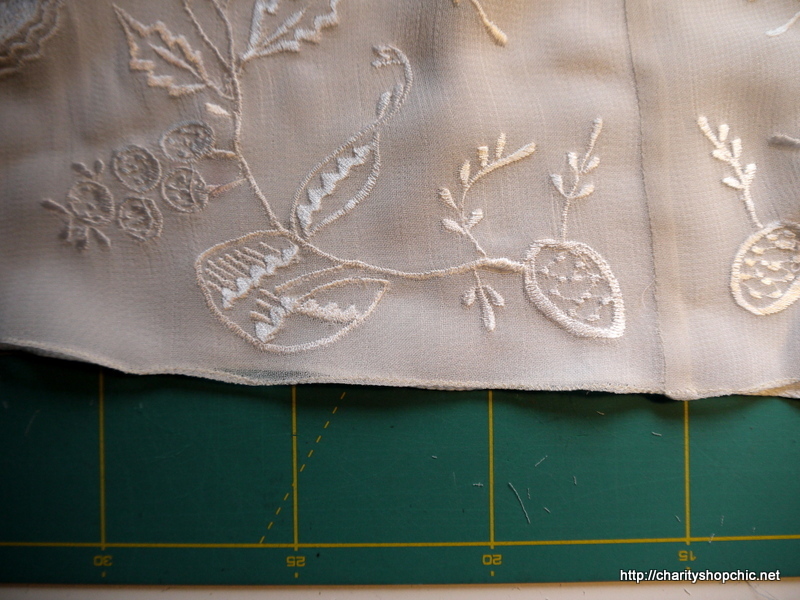 The embroidered panels are used as an overlay to the front, hemmed separately. 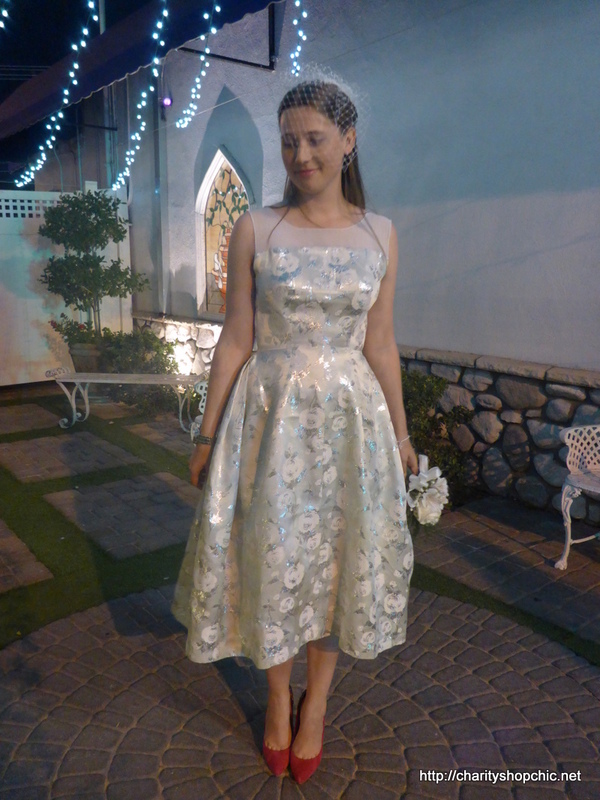 Probably with the memories of the Elvis wedding dress in mind, I chose to use the same finish as I used on the illusion neckline for that dress. 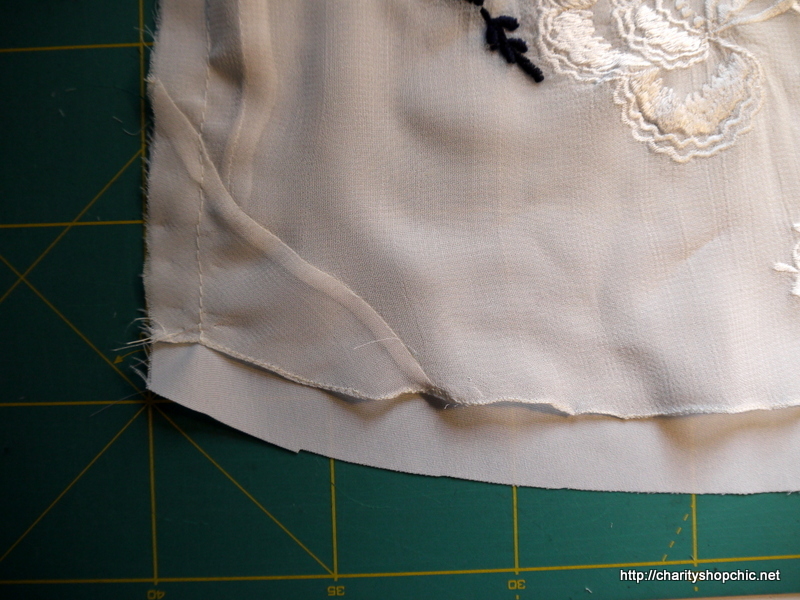 It’s essentially a folded edge with a tight zig zag over the edge, then the excess is trimmed. After securing my rouleau loop straps I did the same finish all the way around the front and back necklines and armholes. It’s not 100% perfect – a bit wobbly in places – but I really like the thin, lightweight effect this technique has. I hemmed the overlay separately to the inside front and I really like how it falls – the overlay ended up slightly shorter which I think helps emphasise the fact that it’s a double layer. 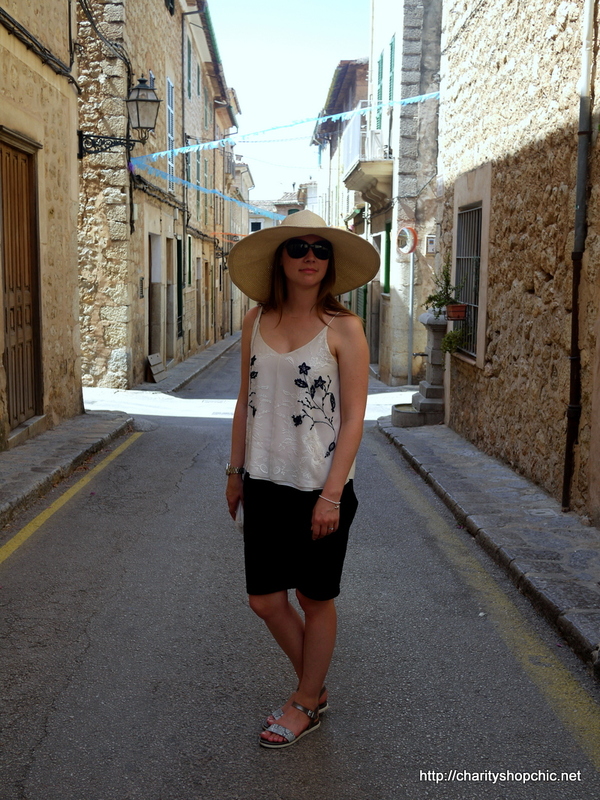 This top got a LOT of wear on my recent trip to Majorca. 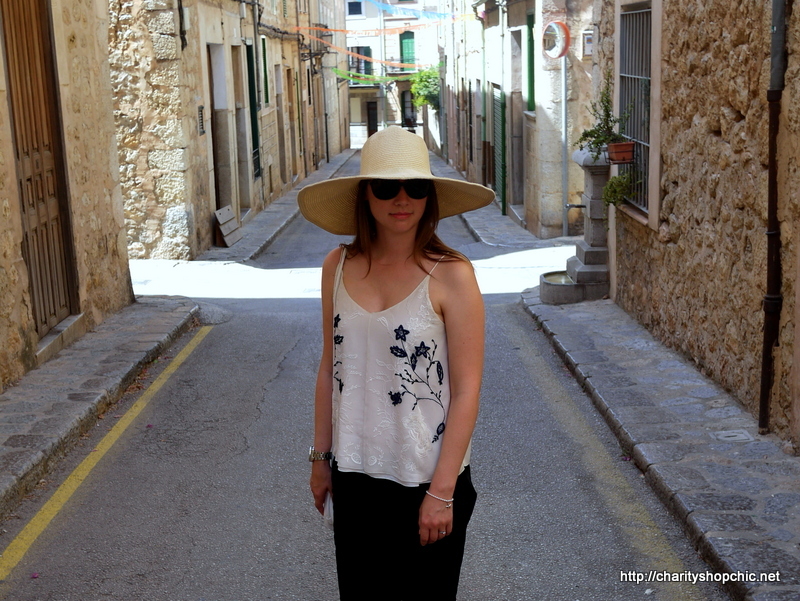 We stayed in Soller and it was the perfect outfit for exploring the old, narrow streets. 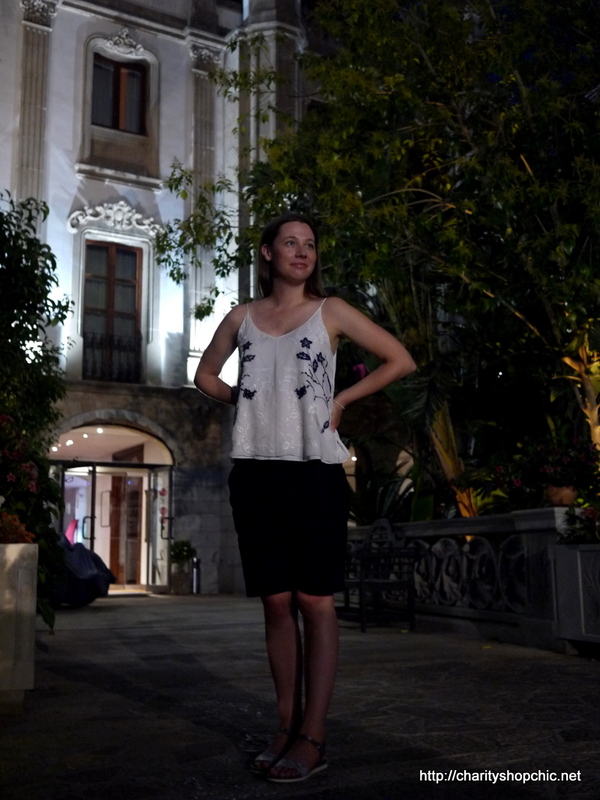 It also did excellently as a day-to-night outfit, ideal for dinner outdoors in the balmy temperatures. Looking at these pictures I possibly could have done with some more blue pattern in the centre front. But I do love it the way it is. Since my shoulders weren’t covered, I needed my hat to protect me from the sun during the day, but no big deal. The two-tone embroidery is such a lovely effect. In real life it is slightly shiny and also gives the piece an interesting texture. I chose a fan to match my outfit from the local market, which ended up coming everywhere with me! Thank you so much, Kasia! You’re right, the blue pattern is very visible whereas the white is more subtle… I love this effect and will definitely do this again. You are amazing, I love seeing what you create from your finds! Thanks for your support, Margaret! I am so glad you’re enjoying reading. good to see you’re back! I’m back, I’m back! :) Thanks for reading! You are welcome, Evi! I’m so glad you are enjoying reading about my projects. Thanks, Dolores! Glad you can use the idea, good luck with the shirt! Beautiful. 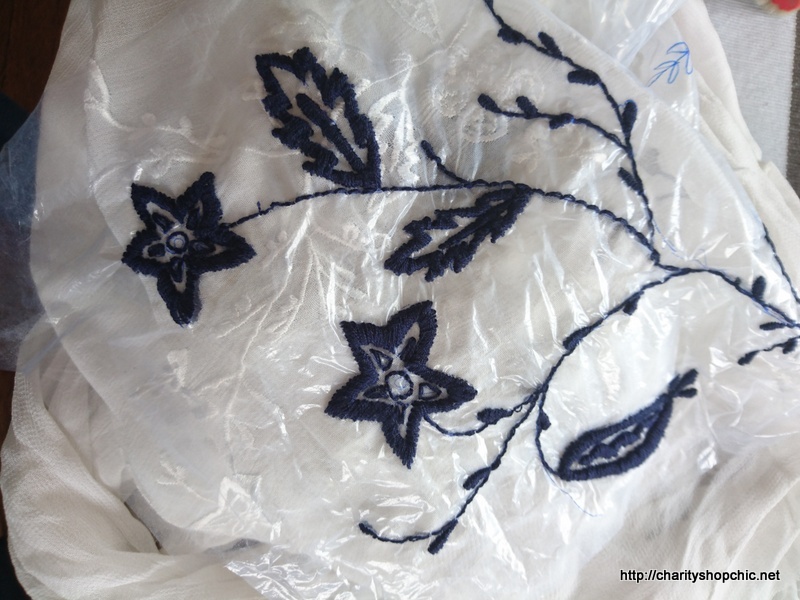 Embroidery is something that I naver learnt to do, but you have inspired me to look at charity shop clothes in a different way. 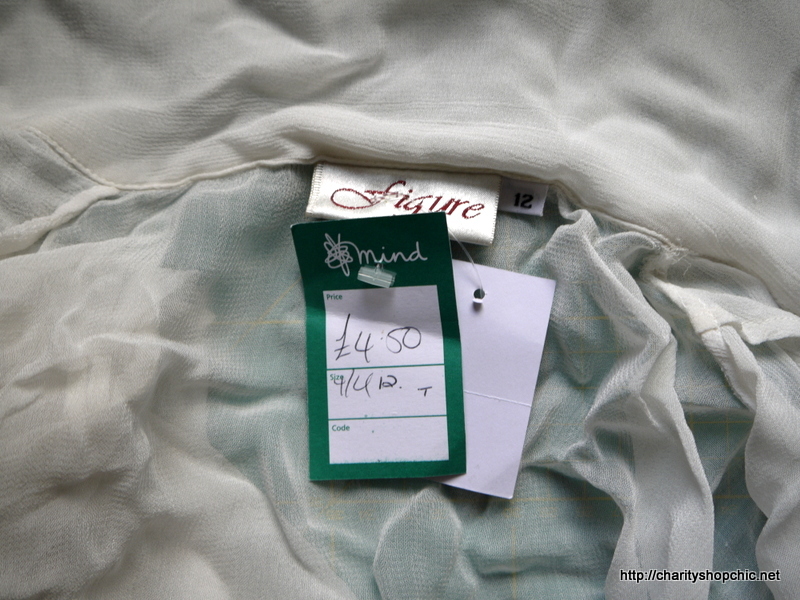 Got fabric lining and invisible zip for £1. 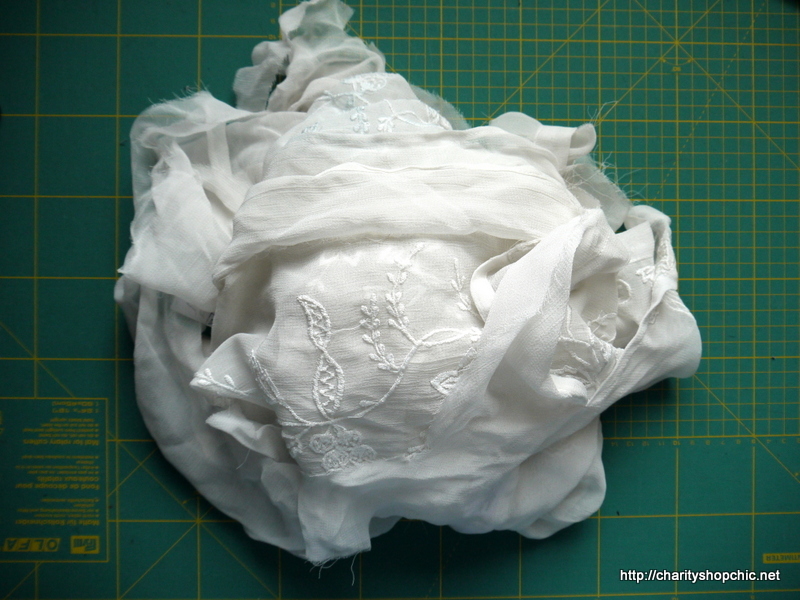 I aim to transform it into a long sleeved dress, it’s all unpicked and ready to go. Would never have done that without you. Thanks for being so inspirational. I’ve even started looking at men’s shirts. 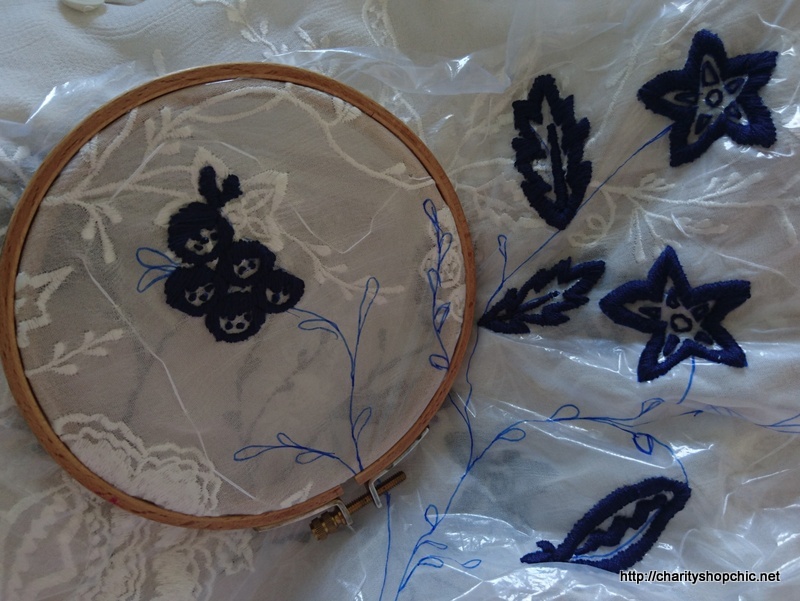 Hi April, you should definitely give embroidery a try! It’s easier than you think, especially if you start with something simple. I’m glad you’re enjoying charity shopping and so pleased you are finding inspiration from my small corner of the internet! Thanks for reading and happy sewing! What a great refashion. I have been trying to adapt a linen shirt for the past three months. I keep going back to it and cutting bits off, by the time I’ve finished it will be doll size! You’ve inspired me to go back and rethink my ideas. Thank you. Hello and thank you for commenting! 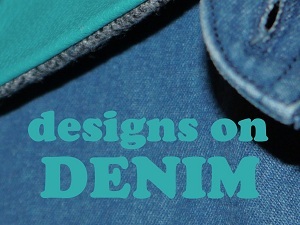 So glad you’re inspired by this and good luck with the shirt refashion! This top looks lovely for hot weather. I have never heard of that ‘Figure’ brand. Please keep the refashions coming. 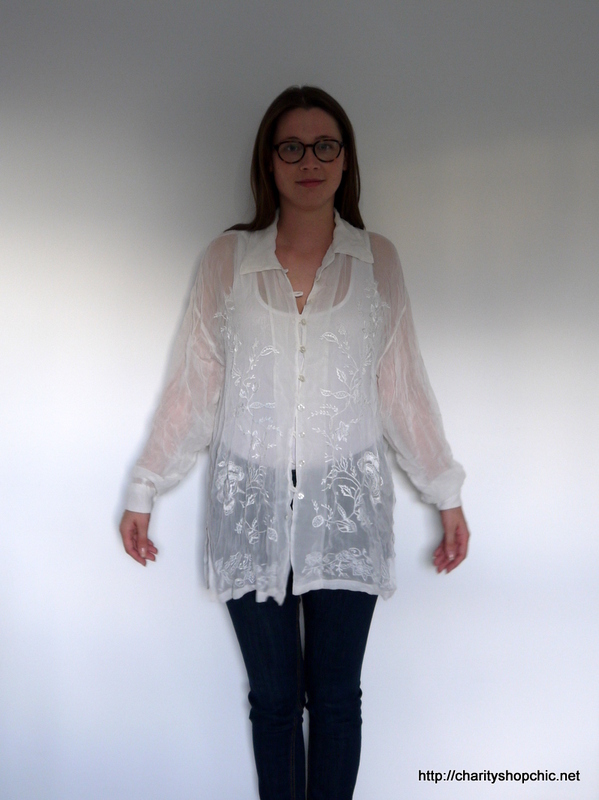 I had never heard of it either – not sure how old the original blouse was. Thanks for reading! You are welcome. Love your blog. What can I say? You are so clever! 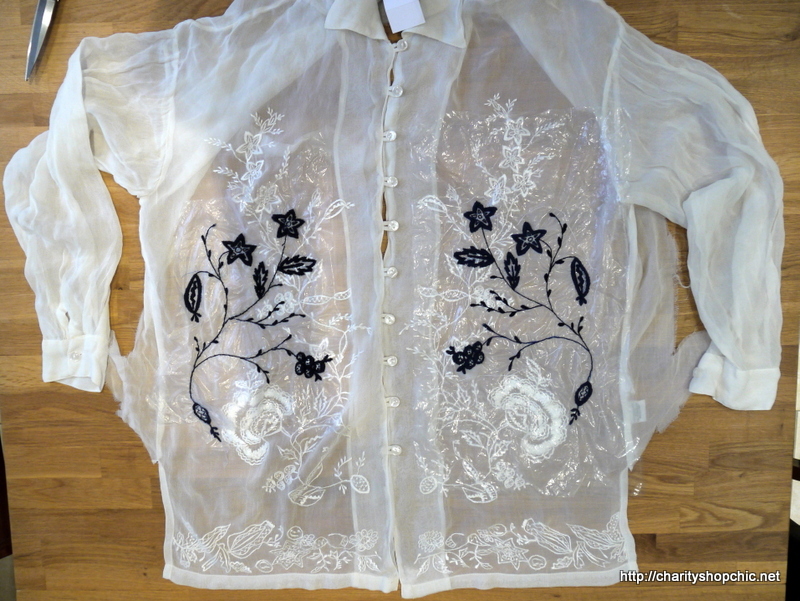 I immediately wanted one of these, as usual with your refashions, and think of all the white embroidered tops I’ve sent off to charity shops – gah! Haha, you’ll have to go round the charity shops and see if you can buy one back! ;-) Thanks for your support, Sue! Thanks so much, Lynsey! So glad you’re enjoying reading. Haha, thanks Christina! No need to be intimidated, some of this stuff is really quite straightforward ;-) I’m so glad you are finding it inspiring! Thanks so much for reading! Beautiful and it’s looks wonderful on you! As always, your work is amazing. Congratulations, the top looks fantastic. Thank you so much, Kim! I appreciate your continued support. Absolutely amazing! I love it when your blog notification pops up in my emails, always a joy to read! Haha, I’m glad! Thanks for sticking with me! Girl, you’re so talented! This top is simply elegant and so beautiful! Great job!!! Very pretty! Embroidery, other than cross-stitch, seems like it’s gone by the wayside. It’s great to see someone using it to make something more special. Thank you! I agree, you don’t see much embroidery around these days. I really think it can be fashionable if done in the right way. Thank you Kathleen! 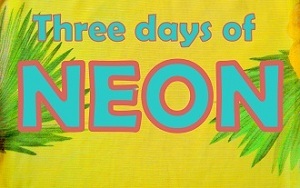 I have loved wearing this over the summer. 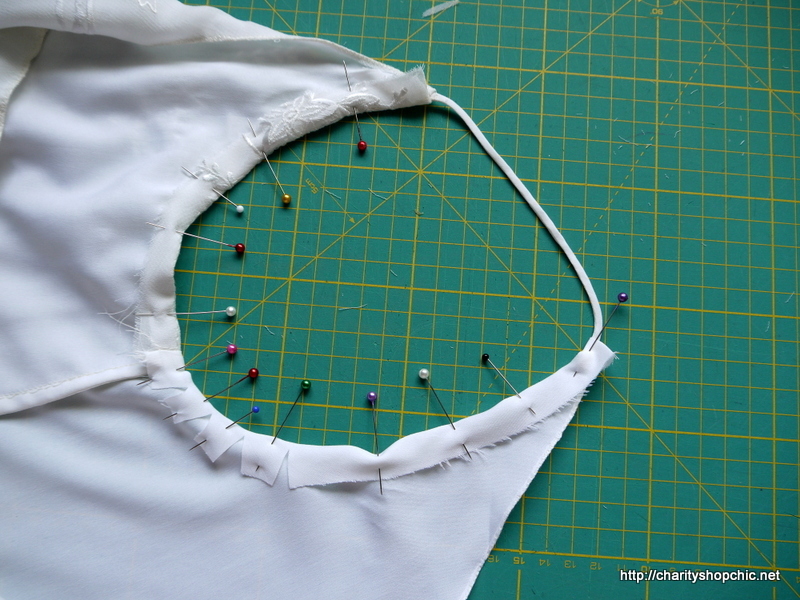 You’re right, refashioning is harder than it looks, but I still think it is a great way to get into sewing. Thanks for reading! This is really, really gorgeous! I love the contrast of the black against the white and sheer. It’s impressive that you were able to get two distinctly amazing garments from the same shirt! 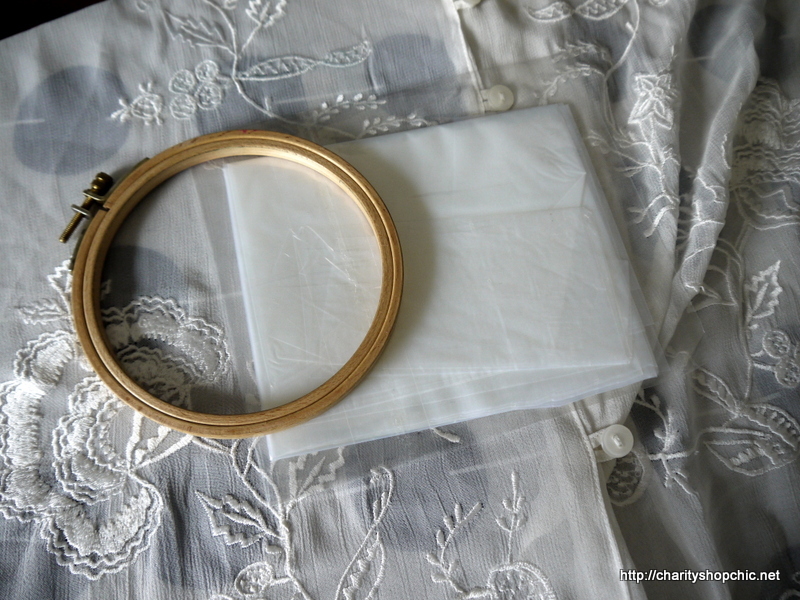 Every time I start reading one of your post, I wonder: “What on earth is she going to make with this unwearable piece?” I just read on and the finished garment is always magnificient. What a creative talent you have. Please keep posting your re-creations as they are most inspiring! HAHA great! I like to surprise you ;-) So glad you are enjoying reading and thank you for your support. 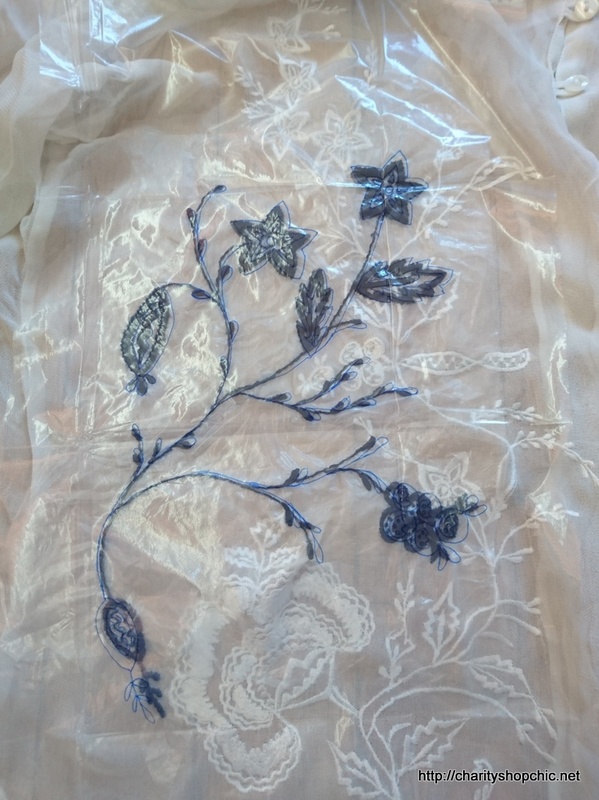 Thanks Jo, I love embroidery and can’t pass up embroidered garments when I see them! 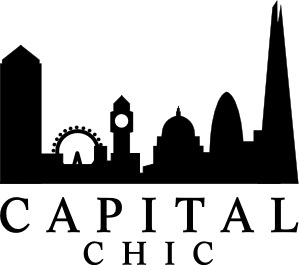 I love your blog and I can’t wait for the next ‘re-fashion’! you are such an inspiration.